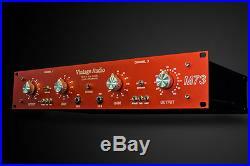 Is based on the coveted 1290 preamp circuit used in modules like the 1073, 1081,1084. They have an incredibly smooth character and just seem to make everything you send thru them sound even better. 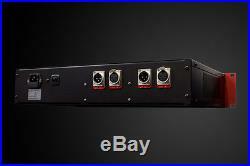 Is a dual channel, three stage, all discrete, Class A, transformer coupled preamp. Utilizes an all discrete transistor design and offers a Direct Input on both channels as well as Phantom, Phase, Pad and Impedance switching. We use Carnhill UK transformers to keep the sounds as close as is possible to the original. The three stages of amplification provide the user with 75+db of gain at the output via a Grayhill stepped attenuator. Also offers an impedance switch at the microphone input between 300 ohms and 1.2k. The higher impedance is really nice for Ribbon microphones but works well as a color option as well. Direct inputs on both channels. Remote Relay switched: pad, and phase for lower noise floor. Impedance switching between 300 and 1.2k ohms. 48Volt phantom is on board for condensers and other studio microphones. Transformer coupled inputs and outputs. Variable input via a Gray Hill Stepped attenuator. Variable output control (allows the user to adjust the output stage for the amount of output hitting the output transformer). 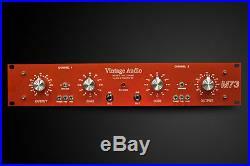 The item "VINTAGE AUDIO BRAND M73, 1073 STYLE DUAL MIC PREAMP, NEVE STYLE PREAMP" is in sale since Tuesday, November 11, 2014. This item is in the category "Musical Instruments & Gear\Pro Audio Equipment\Preamps & Channel Strips". The seller is "reviveaudio" and is located in Boise, Idaho. This item can be shipped to North, South, or Latin America, to all countries in Europe, to Japan, to Australia.